We have updated the website with a list of corporate, magazine and other new publications. If you have written a short opinion piece our would like to advocate our cause, be sure to get in contact with the noted organizations. You can now follow updates by following our Twitter account and #growupaustralia tag! A message to all our supporting Facebook members! We have almost reached 5000 members which is phenomenal! Thank-you! Unfortunately once we exceed 5000 members in our Facebook group, it will cease to give us the ability to send out important updates. For future updates, you will be able to subscribe to the RSS feed or mailing list from our website, http://www.growupaustralia.com. We have also put all of the latest news from various related sources on the site. Hopefully this makes it easier for you to stay involved, and keep track of new changes and developments for R18+ in Australia. Be sure to continue passing the ‘Grow up Australia’ links to your friends, so we can continue to raise awareness and build momentum towards R18+ for Australia! We have reached a milestone of 1000 signatures! Thanks to everyone who has signed so far. Be sure to continue to pass the link on; the more signatures means more weight behind our cause. We will upload some preliminary survey results soon. Be sure to continue checking the Facebook group for more information. Write your Attorney-General an email day! Posted on 2009-11-09 by Jake Edwards in Updates Comments Off on Write your Attorney-General an email day! Thanks to all the people that sent their emails and letters last Monday the 9th. If you wern’t able to send your email or letter at that time, you can still do so now and help advocate our cause! 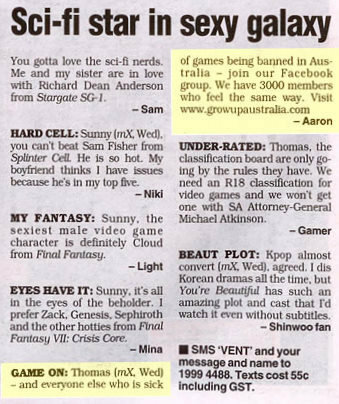 We’re in today’s Sydney mX! Thanks for getting the word out Aaron!